Recurring Payments is only available for Australian merchants. NB: some banks do not accept recurring payments via the eWAY Recurring Payments API. I’ve heard that Bendigo Bank is one that does not. Please check with eWAY and your bank for more information. Tip: you can mix standard and recurring payments on one form. Instead of using a Product field, add a Recurring field to your form and configure it. This method is a little limited, but has been successful for many websites. Payments can be scheduled for weekly, fortnightly, monthly, quarterly, or yearly billing. 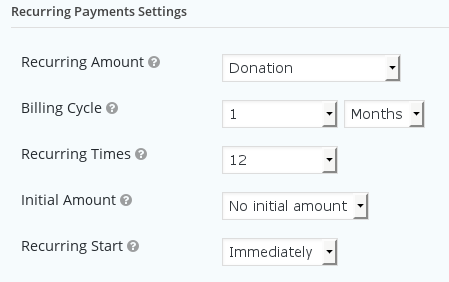 Add a Product field to your form, and create a feed defining how you want to process recurring payments. This method is very flexible and can be easily used to create sophisticated subscription forms. eWAY doesn’t really support a proper sandbox for recurring payments. When you set your recurring payments to use Test mode, it uses eWAY’s general pool sandbox for customer ID 87654321. This allows recurring payment submissions to be tested, but doesn’t provide you with a way to see the scheduled payments in MYeWAY.